The 50-franc note focuses on the wealth of experiences Switzerland has to offer – expressed by the wind, the note’s key motif. The wind carries forth the seed of the dandelion, which is held playfully in the hand. The arrows on the globe show the direction of the winds that connect Switzerland with other regions and continents. The arrows feature in the background on the front of the note. Mountains evoke Switzerland’s varied landscapes. The security strip shows the Alps and lists the names of the main four-thousand-metre peaks in the Swiss Alps, from A for Aletschhorn to Z for Zumsteinspitze. The mountain panorama highlights the wealth of experiences Switzerland has to offer. The wind, the note’s key motif, holds the paraglider aloft in the mountains. The contour lines evoke Switzerland’s varied landscapes. There are many other design elements on the note, all of which illustrate its theme of experiences and its key motif, the wind. The following film introduces you to the 50-franc note’s various design elements. 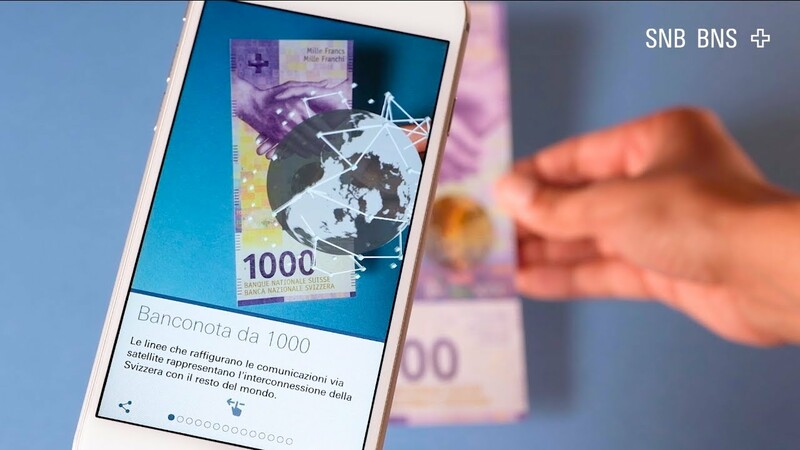 Discover the new note with the SNB's ‘Swiss Banknotes’ app.